Candlelighters serves children diagnosed with cancer being treated in Nevada, from birth to age 21. 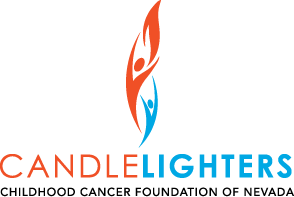 Candlelighters provides family- centered care in which programs and services are available not only to the diagnosed child but their siblings and parents as well. Candlelighters offers bereavement support to families who have lost a child to cancer. Families are provided support contingent on the different stages of the grieving process to meet the needs of the family best. 1 in 285 children living in the U.S. will be diagnosed with cancer this year. 50,000 is the estimated number of children fighting cancer in hospitals today. Cancer remains the most common cause of death by disease for children in America. Click here to download childhood cancer infographic.